The Independent ENCHANTING INTIMACY is the hallmark of Andrew Hilton’s new production of A Midsummer Night’s Dream with the same company that scored such a critical and popular success in his recent staging of King Lear. This was my first visit to the disused Tobacco Factory, in Bristol, where a theatre space has been created enabling 200 people to enjoy Shakespeare at such close quarters that you feel you could reach out and shake Titania awake as she lies in her hammock. The audience sits on three sides of a longish pillar-lined acting area on pews where you’re allowed to balance a drink rather than a hymn book. As well as enclosing the action, you have a rich sense of being enclosed by it. There’s something inherently charged and magical and bonding about gathering in an impromptu space-within-a-space, and Hilton exploits this feature to the full at the haunting finale. As Mark Buffery’s Oberon lays his blessing on the darkened human household, the whole cast swarms in and wafts around carrying lighted tapers in an engulfing, firefly vision of benign other-worldly protectiveness. The spareness and simplicity of the means deployed here often heighten our awareness of the play’s complexity. It is, of course, a standard practice to double Theseus with Oberon and Hippolyta with Titania, and to intimate that the fairy couple go through the central action of the piece as proxies for their Athenian counterparts who are, in some weird way, affected by it in their relationship. But because of restricted numbers, Hilton has also to double his wonderfully idiosyncratic mechanicals and Titania’s fairy retinue. Apart from offering the delicious spectacle of a group of simple-minded workmen crouched down pretending to be gossamer sprites, this adds to the spooky sensation that dreams are merging here. Roland Oliver’s excellent Bottom reaches out in puzzled half-recognition towards these creatures who, Wizard of Oz-like, bear an eerie resemblance to the folks back in the familiar world. It’s a lovely, complicating twist that the fairies are marked by little visual touches of the roles the mechanicals are about to play in their interlude at court. One has a little folding director’s stool strapped to his back like wooden wings. In sprite-guise, John Mackay’s striking Scots Flute, his hair on-end with fright, sports the painted-on eyelashes of his future hilarious Thisbe. Illusion and reality are dizzyingly confounded at such moments. Exactly whose dream is this, anyway? 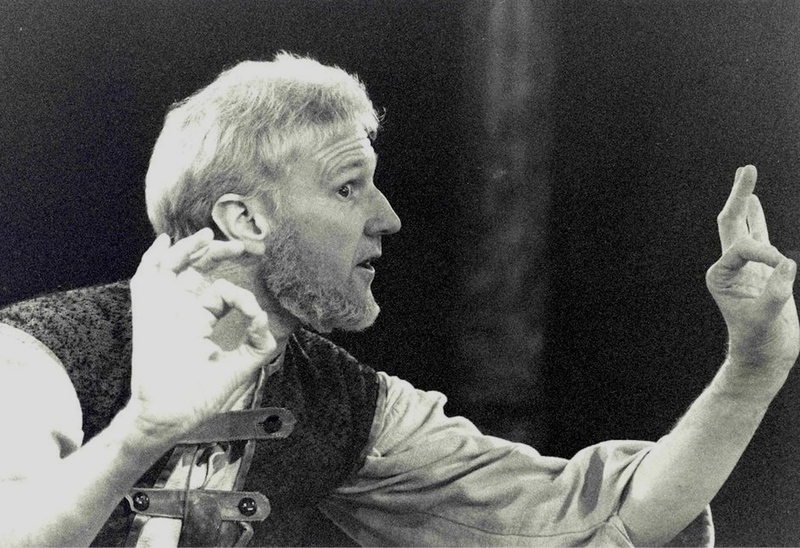 … Before the start, I overheard the woman behind me telling her family how good this cast had been in Lear and lamenting that the Dream would not be such a challenge for them, as it is ‘just a succession of practical jokes’. This unpretentious but potent production would disabuse anyone of that notion. ★★★★ The Guardian Magic on a Shoestring. Andrew Hilton’s brilliantly clear, beautifully simple production is played on an almost totally bare rectangular space with the audience sitting on three sides. Yet despite its minimalism, it conjures up a rare sense of enchantment, creating the feeling that it would be easy to slip between the parallel worlds of humans and fairies. To do this with just a single strand of fairy lights, music and unaccompanied voices is something of an achievement. There is something so fresh and unforced about this production that it reminds me of early Shakespeare productions by the young Deborah Warner. Hilton and his cast tell the story with no fuss but with an exceptional eye for detail. Even the social standing of each of the Mechanicals is clearly delineated; this is not just the usual gaggle of clowns. With merely a dash of eyeliner and an earring they are suddenly and completely transformed into Cobweb, Pease Blossom and Mustard Seed. There are so many similar moments that you wonder if Hilton has his own theatrical magic wand. The lovers, in their various permutations, take centre stage in this production, which celebrates both the transforming power of love and of theatre itself. 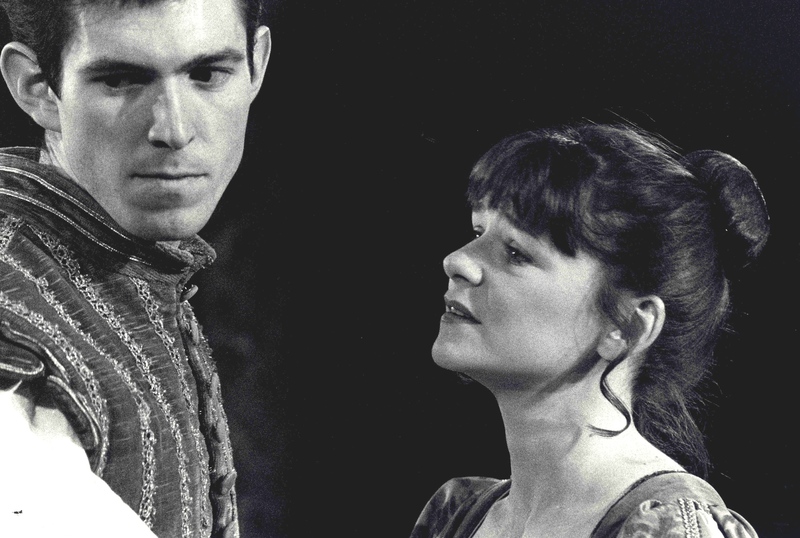 Mark Buffery’s Theseus/Oberon rules the roost with iron charm both in Athens and the enchanted forest, a kind of benign magician ensuring that true love runs its course. Dee Sadler’s wonderfully still, watchful Hippolyta is in thrall to him but also suggests that she has got the measure of the man. There is not a dud performance, and there are some very fine ones: a sly Puck from Chris Donnelly who revels in others’ misfortune and turns up later as a discomforted flunky at the wedding celebrations; an excellent Quince (Peter Clifford), obviously a veteran of amateur dramatics; and a most enjoyable and surprising Flute from John Mackay, whose initial reluctance to play the hapless heroine Thisbe in the Mechanicals’ play turns into a Sarah Bernhardt-type enthusiasm for the role. This is a lovely production, a really great evening out and further proof of how those with real energy and imagination working in the regions are increasingly eschewing theatre buildings in favour of other spaces. Venue There aren’t many companies who can wrap up a magnificent ‘King Lear’ and four days later launch into a brilliantly entertaining ‘Dream’. 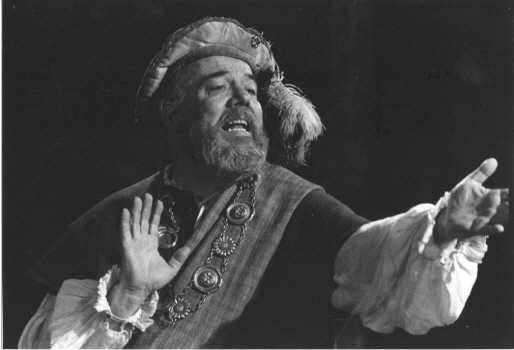 But, as anyone who saw their ‘Lear’ will know, Shakespeare at the Tobacco Factory aren’t just any old company. What they’re doing is very special indeed and their second production has all the qualities which make their work outstanding – clarity, subtlety and in-depth characterisation. 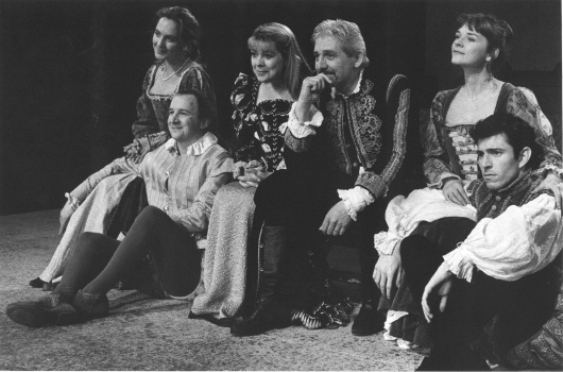 The quartet of lovers whose cross-purposes spark off the plot are beautifully played – the scene where Helena (Saskia Portway) and Hermia (Lucy Black) turn on each other and confuse the hell out of Lysander (Cameron Fitch) and Demetrius (Stuart Crossman) is superb – and even the Mechanicals, who are usually hammed up beyond recognition, have a dignity which makes their ill-advised venture into am dram particularly hilarious. Jonathan Nibbs’s wall-building routine is an absolute show-stopper and Roland Oliver’s good-humoured Bottom – as it were – is matched only by John Mackay’s completely bonkers Flute. A word, too, for Chris Donnelly, whose Puck is a gymnastically mischievous master of ceremonies to Mark Buffery’s lordly Oberon. If you haven’t booked tickets yet, get some immediately. The secret’s out. This company make Shakespeare genuinely exciting again. Which in my childhood I did dote upon. A Midsummer Night’s Dream is one of Shakespeare’s most complete and balanced works, yet it is often remembered only as a vehicle for its own purple passages – for Oberon’s luscious poetry, for the comedy of Bottom and the asses head, or for the farce of the Pyramus and Thisbe play at the climax. The young lovers are commonly disparaged and Theseus and Hippolyta completely ignored. Any production must attempt to change that. To reveal that underpinning the comedy is a profoundly imagined celebration of the power of love – irrational, destructive, transcendent, healing. A power seen – as always in Shakespeare – not in isolation, but as part of the fuller, vibrant and changing patterns of human experience. For Hermia, Helena, Lysander and Demetrius as part of growing up; for Oberon, Theseus, Titania and Hippolyta as part of growing through opposition and strife to richer and more robust relationships. We have followed a common practice and ‘doubled’ Theseus with Oberon and Hippolyta with Titania, which seems to me to strengthen these elements as well as to respond to suggestions in the text that it might well have been what Shakespeare intended. It certainly highlights the central mystery of the play – which is what does Theseus know about the action he frames? Is he the sceptic he pretends to be, or the play’s discreet and modest Prospero?